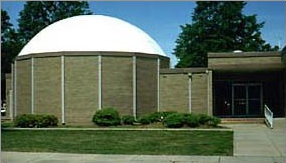 The planetarium is used during school hours to present programs to Chesapeake school classes. Other groups may visit the planetarium when scheduling allows. A moderate fee is charged for group visits. Appointments must be made through the planetarium office. Please call Dr. Hitt’s office (757) 547-0153, ext. 208 Monday through Friday between the hours of 2:00 p.m. and 4:00 p.m. All group reservations will be confirmed by mail.